Comparative Video 101: "All My Trials/All My Sorrows"
"All My Trials/All My Sorrows"
When I set out to do this week's post on "All My Sorrows," I figured that it would fit neatly into the category of which I've written before (most recently of "Coast of California") in which I presented a Kingston Trio popped-up 1950s sounding version of an older folk song that they probably IMHO could have done better had they stuck more closely to the original version. After all, even in the liner notes for the At Large album, commentator and great jazz critic Nat Hentoff writes that the Trio's adaptation is based on an earlier African American song, ("All My Trials"), Hentoff taking Dave Guard at his word that it was a spiritual and probably a lullaby before that. So - "All My Sorrows" would thus be just another crass commercialization of a purer song, right? An arrangement less satisfying than Irving Burgie's (Lord Burgess) unpretentious 4 chord 50s love song on the same album, "The Seine" - a forgettable and forgotten effort, right? Well, not quite. It turned out that "All My Trials" is of extremely uncertain pedigree, and the chances seem very good that the "folk" song was in fact assembled from fragments of earlier spirituals to sound like a traditional song when it was set to a mysterious Bahamian lullaby that no one really seems ever to have heard or bothered to record. Joan Baez wrote in her Songbook that she thought it was a slave spiritual from our own South that migrated to the Bahamas and was forgotten here - but that sounds to me like Baez is trying to invent a pedigree for a song where none really exists, as I suggested that some pop folk singers did back in the folk boom days. All of my reliable fact checking websites and sources - the Lomax books, other ballad collections, Mudcat.org, Jim McGuinn's FolkDen, Leslie Nelson-Burns The Contemplator site - all are strangely uncertain about the origin of the song. The earliest commercial recording anyone can find seems to be Bob Gibson in 1956 - on an album of what he thought were "strange" folk songs. Now the "All My Trials" lyrics as sung by Baez and other below include (suspiciously, I'd say) many of the same tropes and lines that Bob used in songs that he actually did write or derive, like "Well, Well, Well" and "You Can Tell The World." I would not be in the least surprised to learn that it was Gibson who took a pleasant and likely musically simpler lullaby from the Bahamas and turned it into a spiritual - which Glenn Yarbrough heard and did in 1958 - and from whom the Trio heard it both as a spiritual and as a love song. When Pete Seeger waxed it in 1961 - it became a kind of civil rights era folk anthem. 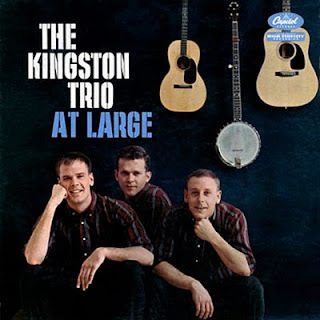 But the copyright of the Kingston "All My Sorrows" belongs to Guard, Shane and Reynolds (though probably as a variation on an earlier adaptation by Glenn Yarbrough of The Limeliters) - and to my surprise and as you'll see below - that song was covered and turned into a minor hit by two other groups. There is almost a chill in the clarity of Baez' voice, less warm and inflected than that of Judy Collins or Joni Mitchell - but one of the most impressive instruments that an American folksinger ever had to work with. The lady is unidentified - I can't run down the album either. Not to my taste, but it sold pretty well in Britain, I'm told. As far as judging pop folk songs by illusory standards of "authenticity" - I just read that it was actually the great dulcimer player John Jacob Niles who wrote "Black Is The Color Of My True Love's Hair" and was so mortified by that fact that he claimed to have heard it from an old mountain lady to give it that elusive pedigree - well, in the words of Nick Reynolds at the end of the Kingston version of Cisco Houston's "Badman Blunder" - "This whole thing has sure been a lesson to me!" Nick Drake never married. Gabrielle is his sister. thanks, chuck - more faulty sources . will change that directly. "Si Me Quieres Escribir/Coast Of California"